Topps issued the first wave of All-New Series 2 in a Test Release to limited markets in spring 2005. It was followed in summer by a Nationwide Release which introduced changes to the series' packaging and to one of the insert sets. 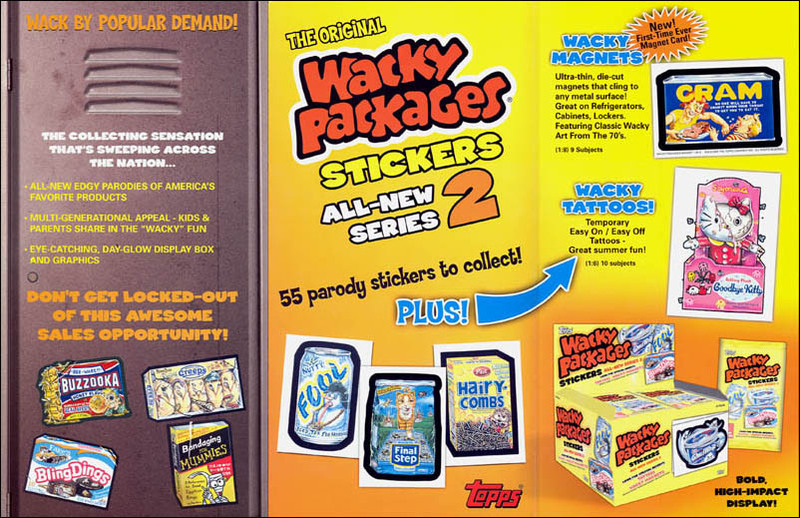 The Test Release version of Wacky Packages All-New Series 2 (ANS2) shipped from Topps in early March 2005, almost ten months after the publication of All-New Series 1. Originally slated for Fall of 2004, the publication of the series was delayed to allow ANS1 more time to sell through the market. The Test Release was targeted at the New York metropolitan area, in which 2004's ANS1 had seen impressive sales. ANS2 boxes were soon to be found in limited quantities at stores such as Wal-Mart and Target in other cities as well. Cases and boxes were also readily available on eBay, where pre-sale auctions had begun up to a month in advance. Like ANS1, the ANS2 Test issue consisted of 55 base stickers and 2 "chase card" subsets: tattoos (10 subjects, 1 in every 6 packs) and clear vinyl cling stickers (9 subjects, 1 in every 4 packs). The tattoo subjects were based on 10 titles from the base set, while the clings were derived from classic Wacky Packages stickers from 1967 to 1985. Some quality control issues were seen with the Test release, including packs that contained fewer (or more) than 6 stickers, and small tears on the backs on the chase cards. Collectors who sent their damaged cards back to Topps quickly received replacements. Click on the hyperlinked names for additional information about individual titles. 16 [ ] Slobway 44 [ ] Koff! B4 Plop on Pop John Pound ? Starting in the summer of 2004, promotions for ANS2 included giveaway cards; flyers and other printed advertising; ads on the Web; and a television commercial. Visitors to the Topps booth at the 2004 San Diego Comic-Con (July 22-25) received a sneak peek at ANS2 when company representatives gave away the "Goodbye Kitty" advance promotional sticker, numbered P1. "Kitty", conceived by writer/artist David Gross, was later issued as Base Sticker #1 in the final All-New Series 2 set. The back of the P1 card lists Fall '04 as the ANS2 release date. Topps distributed a free card (not a die-cut sticker) at the 2005 San Diego Comic-Con (July 14-17) which served as a promotion for both ANS2 and a tease for All-New Series 3, which was then five months away from its initial release. The image then appeared on base card #29 in ANS3. The card front is a parody of the cover of Amazing Fantasy #15 (1962), the first appearance of Marvel's Spider-Man. The back of the card touts ANS2 as "On Sale Now!" while suggesting that ANS3 is "Coming Soon." The sell sheet for the Test Release is distinguishable from the subsequent Nationwide Release sheet in that it promotes cling inserts, and the mock-ups of the the box and pack show "Bling Dings" as one of the three featured titles (the released packaging had "Buzzooka" in its place). The word "Tattoos" is also misspelled on the mock-up packaging. Nationwide sheet #1 is very similar to the Test sheet, but it promotes magnet inserts, and more accurately shows "Buzzooka" on the packaging. Another sell sheet was issued to focus on supporting promotions such as TV advertising for the Nationwide Release. Topps issued a 2-sided flyer in May 2005 that heralded "massive promotional support" for the Nationwide Release of ANS2, including a TV commercial and licensed products. This sheet previewed display arrangements for the Nationwide Release of ANS2. Included in each ANS2 hobby box (coded 1-777-30-02-4) was a poster meant to be hung in specialty stores such as comics and card collectible shops. The poster design is very similar to the layout of the back of the "Annoying Spitter-Man" promo card; a variation on the theme was also used in magazine ads. Panel 1 (front cover) of the tri-fold brochure appears as the outside door of a school locker, plastered with ANS2 Wacky Packages. When the brochure is opened, panel 2 (inside front cover) appears as the back of the door, with more stuck Wackys. The folded-over panel 5 depicts the interior of the locker with a box, packs, more Wacky stickers, and a cameo appearance by a Garbage Pail Kids sticker from All-New Series 4, "Nin JACK", (painted by Luis Diaz, the artist of ANS2's "Starducks"). Panel 5 folds back to reveal panels 3 and 4, which provide details on the series and depict a mock-up of the box, packs, sample base stickers, and inserts. Finally, panel 6 (back cover) lists some of the expected promotions. An early version of the "Locker" brochure was apparently issued for the Test release. Based on the scans of it from eBay auctions, it appears to be a two-sided flyer, but this has not been confirmed. 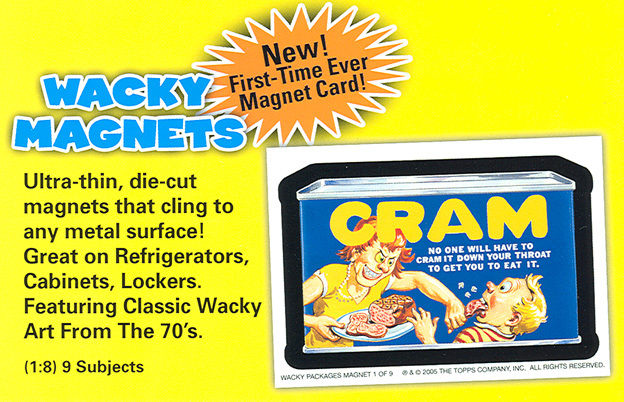 Side 1 - Elements which distinguish this flyer from the tri-fold "Locker" brochure include: cling inserts are advertised rather than magnets, and the word "locked" is misspelled as "locke" (this is corrected in the later brochure). Side 2 - The mock-ups of the ANS2 box and packs in the brochure indicate cling inserts, and show "Bling Dings" as one of the featured titles on the packaging. On the actual boxes and pack wrappers, "Bling Dings" was replaced by "Buzzooka." The tri-fold brochure corrects the misspelling of "locked" found on the earlier flyer. All references to cling inserts on the earlier flyer have been replaced with references to magnets. The packaging mock-ups still show "Bling Dings" rather than "Buzzooka" as on the actual boxes and wrappers. A full-page ad for ANS2 was printed in this issue, which went on sale the week of August 10, 2005. The overall design of the ad is similar to that of the hobby box poster and the back of the "Spitter-Man" promo card. This issue of the distributor's catalog carried a solicitation to hobby and comics shops for orders of ANS2 on page 418. Previously, Topps had only solicited the series in Diamond's Previews Update in April 2005. A full-page advertisement for the Topps Vault, spotlighting ANS2 art auctions, appeared in this issue on page 31. Designed by trading card distributor Excell Marketing, this display was featured in the card sections in many Target stores. Unlike the equivalent ANS1 item, this sheet appeared only after the Nationwide Release had begun selling in Target, and the legend at the bottom read "Available Now" rather than an advance date. The sheets were marked to be displayed from 8/15 to 9/15/05. While there were many web pages that promoted All-New Series 2, this section concentrates on official Topps web content, including company ads on non-Topps sites. Topps posted its first preview web page for ANS2 in June 2005 (left). After the Topps site redesign, the preview page was revised slightly (right). Starting in mid-July, the redesigned Topps home page featured ANS2 prominently on one of the slides in a Shockwave slideshow that cycled when the page first loaded. Topps' redesigned Entertainment page featured: a graphic that changed on mouseover, which linked to the ANS2 preview page; a small banner linking to the "Wacky Mart" at www.wackypackages.com; and a "Coming Soon" banner ad. The Topps Vault web site promoted auctions for ANS2 original art and for exclusive autographed, PSA-graded card sets. The ANS2 art auctions began on June 1, 2005 and continued to run into autumn; the autographed card auctions started September 21. Art Auction Ad #1A - Posted on the Topps Vault home page in May, this animated GIF announced that auctions were "Coming This June". Art Auction Ad #2 - This static image was linked from the Topps Vault news page. Art Auction Ad #1B - This animated GIF (adapted from Ad #1A above) tells visitors to the Topps Vault home page that auctions are "Going on Now". Art Auction Ad #3 - The ToppsVault eBay store page displayed this animated banner. Autographed Card Auction Ad #1A - Preview graphic originally found on the Topps Vault news page. Autographed Card Auction Ad #2 - This preview image was linked from the Topps Vault news page. Autographed Card Auction Ad #1B - The ad above was changed to read "Available Now". Autographed Card Auction Ad #3 - The ToppsVault eBay store page displayed this banner. The front page of the official site acknowledged the release of ANS2 in late August 2005 with a single graphic. Topps made no further updates to the site during the shelf life of the second series. According to Topps' promotional material, a commercial for ANS2 was given a tryout in the New York market at the time of the Test Release. The ad began running nationally on Nickelodeon and Cartoon Network on August 22, 2005. The color scheme for ANS2 packaging was bright yellow with a red Wacky Packages logo. 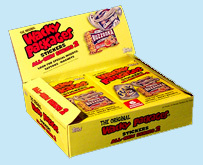 The logo was preceded by "The Original", perhaps to ensure that Topps' Wackys would be distinguished from unauthorized bootlegs, as well as from fan-produced tribute series such as Package Parodies, Pranky Products, and Silly Supermarket Stickers. ANS2 foil wrappers were yellow with a red logo—a fitting follow-up to ANS1's red packaging, since in the Wacky lines issued in 1973 and in 1979, yellow packs followed red. Packs contained 6 cards, with a 1–in–4 packs chance of finding a cling insert, and a 1–in–6 chance of pulling a tattoo. They could be found in priced (99 cents) or unpriced versions. The back of the pack wrapper announced that Topps Vault auctions for ANS2 art would begin on June 1, 2005. For a thorough breakdown of the dizzying array of packaging variations offered in the two waves of ANS2, see Greg Grant's page, "Wacky Packages 2005 Boxes, Shipping Cases and Packs." 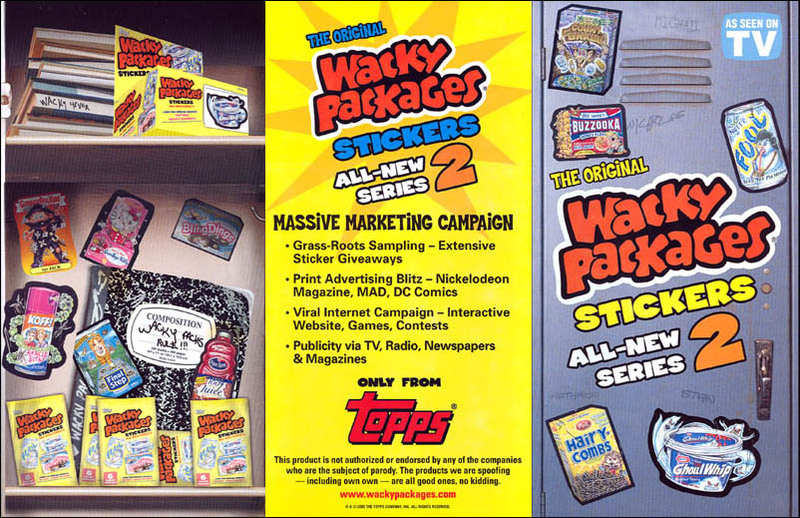 The Wacky Packages Official Collector Album shipped from Topps in late July to accompany the Nationwide release of ANS2. The 6" x 8" album contained 14 pages with 4 vinyl pockets each, for storing 56 cards. A flyer that surfaced in May 2005 advertised the Official Collector Album. On the flyer, the name of the item is shown to be "Sticker Album" rather than "Collector Album." The name may have been changed because "sticker album" suggests that the stickers are to be peeled and stuck inside. One illustration on the flyer showed the unpublished "Slacker Jack" sticker in an album pocket, perhaps a hint that the flyer was developed at a stage when "Slacker" was still on the series checklist. A case contained 2 boxes with 10 albums per box.